We had booked all the Port Blair excursion activities through Experience Andamans. Even though I would have liked them to be little bit more communicative through emails or SMS etc with us, the over all experience was good. We called them the previous day and they told us to be ready at 11:00 AM. We got up and went for breakfast. The view from the hotel restaurant is just amazing. The agenda for the day included Water Sports complex, Ross Island and Sun set at Chidiya Tapu. The view from the hotel is immortalized on Rs. 20/- currency note. 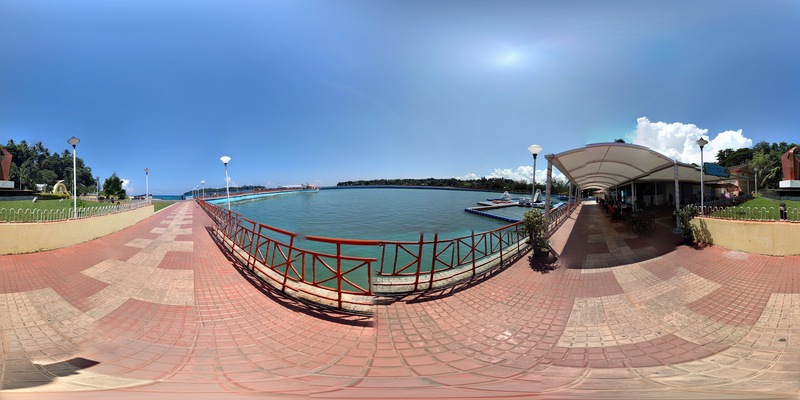 The first stop was Water Sport Complex from where we were to take the ferry to Ross Island. We reached the water sport complex. There is a decent restaurant called Ocean Blue. We sat in the restaurant while Experience Andamans guy went to arrange for ferry tickets. 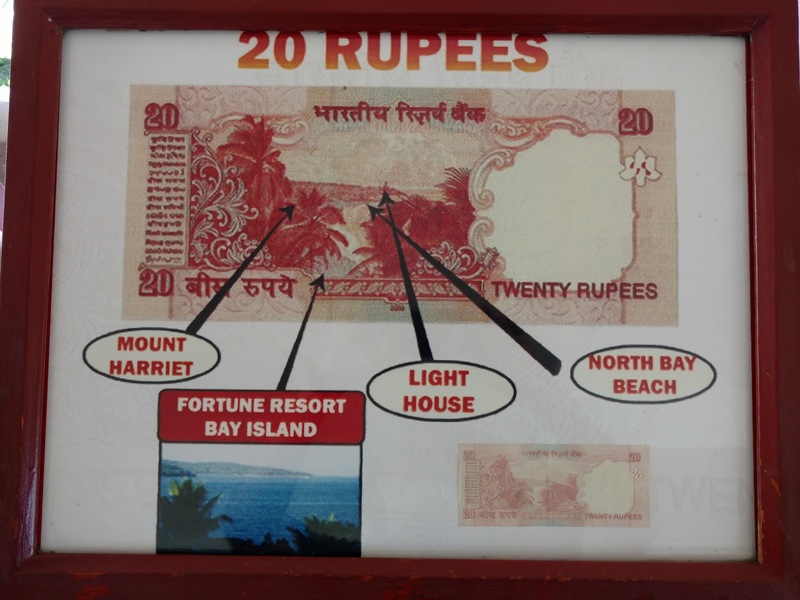 All these things can be done by tourists themselves but there are so many ferry tickets and other tickets and many of them require your identification proofs etc., we left it to Experience Andamans and Barefoot to arrange these for us. Ross Island is maintained by Indian Navy so one needs identification proof to be produced to enter the island. An electronic pass is issued that has to be returned back on exit. Machines from Water Distillation Plant. Malaria and other water-borne diseases were responsible for a number of deaths specially of infants during the early years of settlers at Ross Island. Hence British thought it necessary to have a distilling plant and mineral water plant to produce pure water for drinking. Today the plant is covered by the roots of trees around it. The fine lattice of roots, holding this crumbling structure together belong to the trees of Ficus family. The huge boiler made of special steel still stands. The facade of Subordinate Club building is seen in the picture to the right. The club was for the junior commissioned officers, non commissioned officers and other ranks of the British troops at Ross Island. It had a teak dance floor which was mounted on springs and the entire window frame-work and its panes were made of stained glass from Italy. The band had its position on an elevated platform at the western end of the wall. The quality of wood was so good that it has survived the vagaries of the weather over the last 100 years. The church is on top of a small hill on the island. You can walk on the other side of the church and there is a small beach. Chidiya tapu is famous for its sun-set, unfortunately for us, there was a thick cover of cloud in west and we could not really see the sunset. It has a small beach as well.